This important book provides detailed critiques of the method of transcendental argumentation and the transcendental realist account of the concept of causal power that are among the core tenets of the bhaskarian version of critical realism. Kaidesoja also assesses the notions of human agency, social structure and emergence that have been advanced by prominent critical realists, including Roy Bhaskar, Margaret Archer and Tony Lawson. The main line of argument in this context indicates that the uses of these concepts in critical realism involve ambiguities and problematic anti-naturalist presuppositions. As a whole, these arguments are intended to show that to avoid these ambiguities and problems, critical realist social ontology should be naturalized. This not only means that transcendental arguments for ontological doctrines are firmly rejected and the notion of causal power interpreted in a non-transcendental realist way. Naturalization of the critical realist social ontology also entails that many of the core concepts of this ontology should be modified so that attention is paid to the ontological presuppositions of various non-positivist explanatory methods and research practices in the current social sciences as well as to new approaches in recent cognitive and neurosciences. 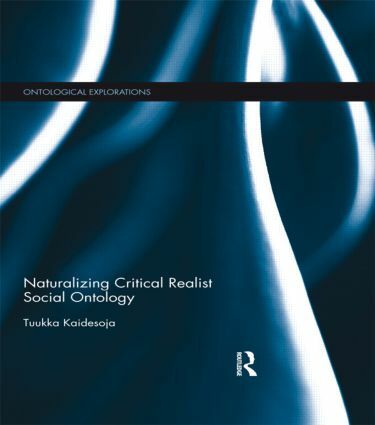 In addition of providing a detailed critique of the original critical realism, the book develops a naturalized version of the critical realist social ontology that is relevant to current explanatory practices in the social sciences. In building this ontology, Kaidesoja selectively draws on Mario Bunge’s systemic and emergentist social ontology, William Wimsatt’s gradual notion of ontological emergence and some recent approaches in cognitive science (i.e. embodied, situated and distributed cognition). This naturalized social ontology rejects transcendental arguments in favor of naturalized arguments and restricts the uses of the notion of causal power to concrete systems, including social systems of various kinds. It is also compatible with a naturalized version of scientific realism as well as many successful explanatory practices in the current social sciences. By employing the conceptual resources of this ontology, Kaidesoja explicates many of the basic concepts of social ontology and social theory, including social system, social mechanism, social structure, social class and social status.